Fixed teeth for a lifetime! An inflammation of the periodontium is referred to as a periodontitis, colloquially called paradontosis. In a relapsing running process, the inflammation destroys tooth tissue and bone that are responsible for the attachment of the tooth. This may take years or decades, but, without treatment, results in the loosening of teeth and is considered, besides the dental caries, as the main cause of loss of teeth. Periodontitis is primary caused by dental plaque that is located on the tooth surfaces and gaps between teeth and causes a chronic inflammatory response of the body. The loss of teeth in adults is often the result of bacterial infections. Every third adult in Germany suffers from a moderate periodontitis and every seventh from a severe periodontitis. This treacherous tooth bed inflammation causes not only damages in the mouth, but can endanger the health of the whole body. A strong change by the new scientific evidence has arisen in current periodontology. 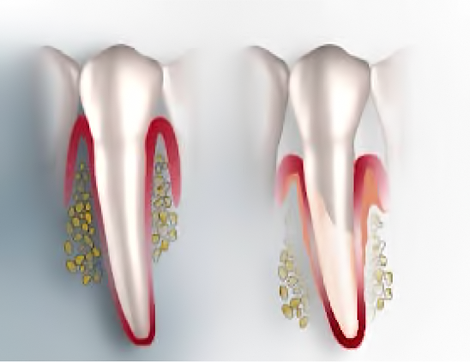 The primary goal is the prevention and detection of periodontal diseases.